SONS OF APOLLO have told Planet Rock that they are "talking a lot" about their second studio album. During an interview at this past weekend's Ramblin' Man Fair, drummer Mike Portnoy and guitarist Ron "Bumblefoot" Thal discussed their plans beyond 2018. Thal said: "We've been talking a lot about album number two — when we can record it, just talking about the future." Asked when they can record the follow-up 2017's "Psychotic Symphony", Mike said: "That's a good question. We're focused right now on this [European] tour... It's the truth — for me, it's the truth. These guys keep pushing me to try to, like, lock down a date for [the next record] and I'm, like, 'I just wanna stay in the now.' But we'll absolutely get there soon enough. Absolutely." 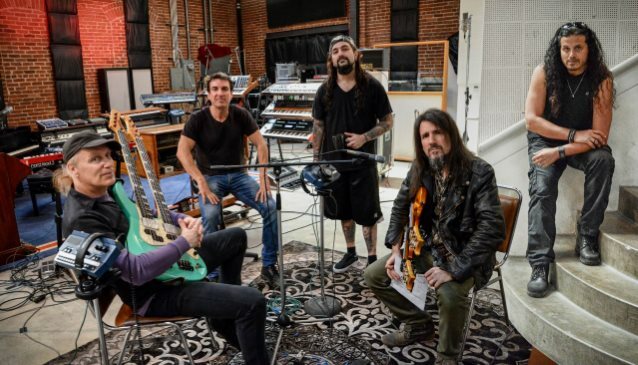 In addition to Portnoy and Thal, SONS OF APOLLO features former DREAM THEATER keyboardist Derek Sherinian, as well as bassist Billy Sheehan (MR. BIG, THE WINERY DOGS) and vocalist Jeff Scott Soto (JOURNEY, TALISMAN, W.E.T.). The band incorporates the progressive style and individual technical prowess that Portnoy and Sherinian shared together in DREAM THEATER combined with the swagger and groove of VAN HALEN, DEEP PURPLE and LED ZEPPELIN. "Psychotic Symphony" came out last October via InsideOut Music. It sold around 5,200 copies in the United States in its first week of release, earning the band the top position on Billboard's Heatseekers chart, which focuses on top-selling albums by new or developing acts, defined as those who have never appeared on the top 100 of the Billboard 200.